Hola! With the seasonal inventory in Boylston at the lowest we've tracked, we have a super high reading for the HSI. 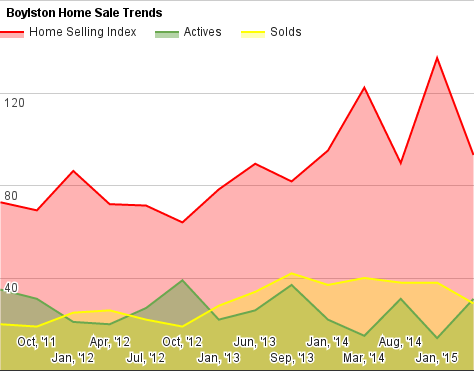 That's inflated a bit, but the market is still good for sellers. 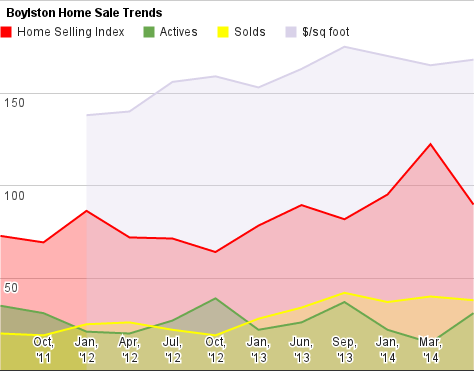 The home prices chart isn't hard to read: Prices are moving up. 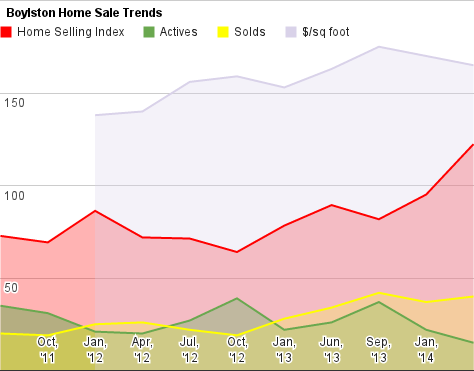 Sellers who have over reached are moving prices back down, and getting closer to where buyers want to be. That, in turn, has kept sales moving briskly. Boylston remains strong - as everywhere else too - getting through the soft point of the market with strong demand. Boylston has a few more choices than many small towns, so is still reasonable. 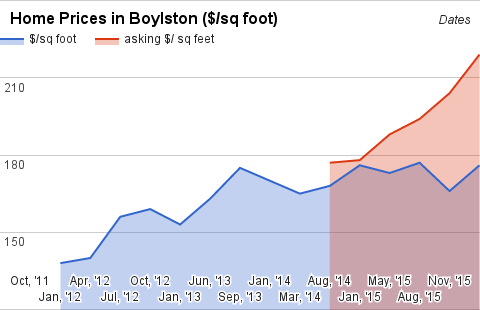 Boylston continues to look sharp; prices are up, and demand remains strong. 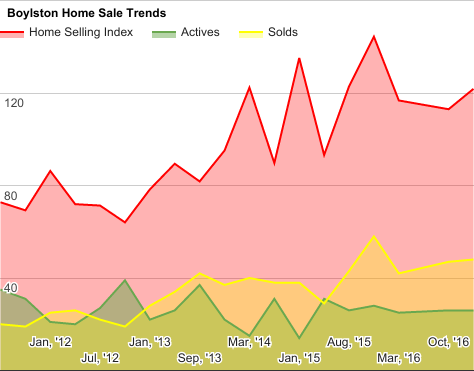 Transaction volume was better this spring, and that's helping. 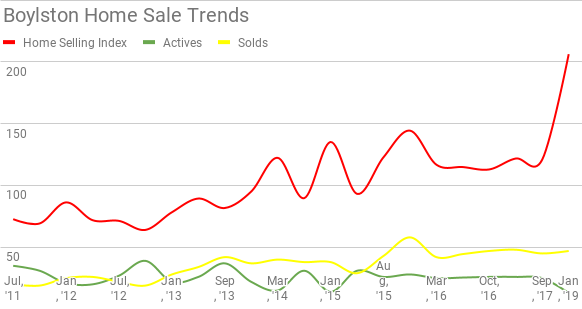 Nobody's going crazy here, but it's moving in the right direction for sellers. Boylston is starting to see a bit of a pull back - more caution by the buyers - and just a hint of growing inventory levels. 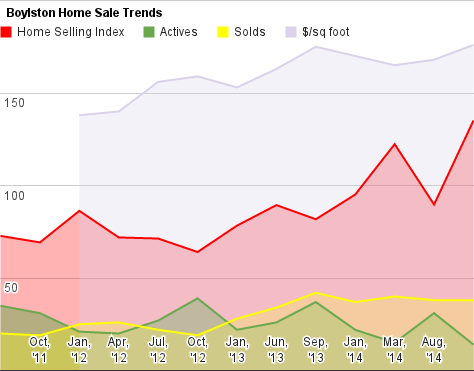 Prices leveled off, and transactions slowed. Let's see! First report of 2015 is out! December was busy, and I gearing up for 2015 was a priority, so I am behind in my posting. But not for long! Let's get the first chart out of the way. 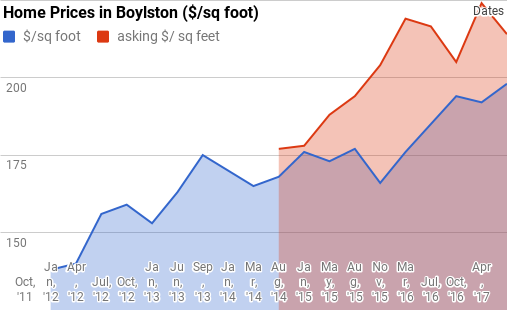 Continuing with our look at the quieter northern towns, we take a peek at Boylston, and the results are a bit of a surprise.